Two years after WordPress usage reached 20%, it achieved the next major milestone: 25% of all websites now use WordPress. Or, as its founder Matt Mullenweg puts it: Seventy-Five to Go. The dominance of WordPress in the CMS market is amazing. 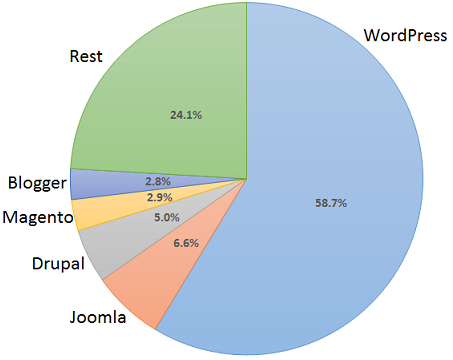 The two closest competitors, Joomla and Drupal combined are used by 4.9%, less than a fifth of WordPress. We do count both the self-hosted, open source version of WordPress which can be downloaded at WordPress.org, and we also count WordPress sites hosted at WordPress.com or elsewhere. However, we count the hosted sites only if they are reachable via their own domain (not only as subdomain of wordpress.com), and they must qualify like all other sites in our surveys by getting enough visitors on that separate domain to make it into the top 10 million Alexa sites. As a result, the vast majority of the millions of blogs at WordPress.com are not counted. Only 1.25% of the WordPress sites in our surveys are hosted by Automattic at WordPress.com. That makes the WordPress CMS market share even more remarkable. WordPress is used by some of the best known websites: Time, TechCrunch, Wired and Lifehack, to name just a few. When we split up all websites by traffic level, we see that WordPress is leading at all levels, but the market share among the top 1000 sites is significantly lower at 30.3%. Drupal (19.7%) and Adobe Experience Manager (11.8%) are the other dominant systems in that section. Note, however, that using a standard CMS is not very common among the top 1000 sites, more than 90% of them are custom developments. We have indicators that show that WordPress is likely to grow even further. In October, 29.5% of new sites used WordPress. New sites usually show the way where the whole market is heading to. Splitting up the whole web into sections by content language reveals further interesting facts: WordPress is used by a staggering 37.3% of English language websites. Usage numbers are between 38% and 40% for Portuguese, Spanish, Swedish and Turkish sites, and they reach 51.3% for Bengali and 54.4% for Bosnian. On the other hand, that number is only 10.6% for Chinese language sites and 6.9% for Korean. Looking at the underlying technologies used by WordPress sites shows that 93.8% of them use a Unix-like operating system, with Ubuntu being the most used Linux distribution. Only 6.2% of WordPress sites use Windows. That is sufficient, however, to make WordPress also the dominant CMS running on Windows servers, ahead of DotNetNuke and SharePoint. With its double freemium model based on open source software and free site hosting, WordPress and Automattic are one of the big success stories of the web. It looks like we have only seen the beginning yet. Readers may note that the free Wordpress blog service is very limited compared to WP self-hosted. It prevents the free use of plugins, requires users to pay for premium themes, injects advertisements into posts, and even charges for redirects; so it is easy to see why the self-hosted option is preferred : "Only 1.25% of the WordPress sites in our surveys are hosted by Automattic at WordPress.com"
Blogger was a favorite years ago due to its simple and friendly interface, but hasn't kept up to Wordpress' continually expanding capabilities.